Guerrilla Zoo and FoolishPeople present The Abattoir Pages, an immersive Halloween event, hosted in a vast, secret subterranean landscape that was once one of London's largest abattoirs. The Abattoir Pages combines immersive performance, art installation, haunting and treasure hunt-style device to form a labyrinth of mystery and horror, exposing the earliest Gaelic and Pagan rites. Once inside, audience members will be free to explore the abandoned underground chambers, join the secret party or may be caught in the middle of the most terrifying of puzzles. This Hallowe’en, the infamous horror author Helen Mayer will hold court at a debauched secret party. She will share the perverse and warped research conducted inside the old abandoned abattoir, which was the genesis of her greatest work. In this dark playground, the very nature of human terror has been tested, abused and fed into the living story 'The Forest'. The Abattoir Pages marks the evolution of the open source meta event as FoolishPeoplepartner with Guerrilla Zoo in an exciting first-time collaboration of two of London's most renowned art organisations alongside cutting edge artists and performers. In addition we are excited to have the infamous purveyors of fine adventures, Hunter-Gatherers as part of our outstanding creative team. The production follows FoolishPeople's critically acclaimed sell-out run of 'Cirxus' at the Arcola Theatre and precedes Guerilla Zoo's 'Season of Alejandro Jodorowsky' productions. 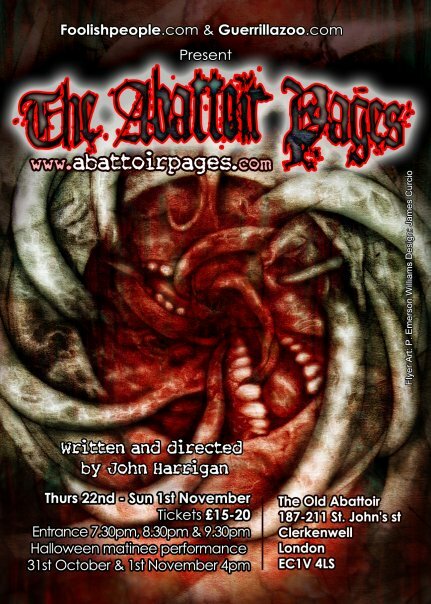 ‘The Abattoir Pages’ is the prologue to a new, large scale work which will be undertaken by FoolishPeople in 2010. NOTE: Not suitable for people of a nervous disposition. Limited disabled access.